REAL estate investors should look at the positive side during the current economic uncertainty, as there is still some upside in this sector, says MGPA Asia Developments chief executive officer Michael Wilkinson. “Construction cost is now at a moderate rate and with careful selection of investment, we can still benefit,” he said during the launch of The Intermark, a fully integrated world class mixed-use development, yesterday. MGPA will invest RM2bil (including acquisition and construction costs) in The Intermark. The amount involves the complete refurbishment of 62-storey landmark grade A office building Vista Tower (formerly known as Empire Tower), a new international grade A office building Integra Tower, retail centre Intermark Mall (formerly known as City Square) and Malaysia’s first Doubletree by Hilton Hotel. MGPA - through it’s Asia Fund 2 - acquired the Empire Tower, City Square, the Crown Princess Hotel and Plaza Ampang in 2007 for about RM760mil. Wilkinson says the reason to refurbish and build the grade A office buildings was because such buildings were limited in the city. “Besides that, the location of the development - at the junction of Jalan Tun Razak and Jalan Ampang - is very strategic, just 500 metres from the Petronas Twin Towers and also about a two-minute walk to the Ampang Park LRT,” he says. He says Malaysia was fortunate to be still resilient in the current climate and, with a strong market, the country was still attractive to investors. Vista Tower is expected to be completed by year-end while the Intermark Mall and DoubleTree by Hilton Hotel will be completed in the first quarter next year. The other building, Integra Tower, is scheduled for completion by end-2012. MGPA, a private equity real estate fund, is investing more than RM1.3 billion to redevelop The Intermark, formerly City Square Centre, in Kuala Lumpur. Chief executive officer for Asia developments Michael Wilkinson said MGPA will also integrate The Intermark and Integra, more commonly known as Plaza Ampang Mall. "The project is about reinstating the landmark in Kuala Lumpur. We have to make it a first-class asset. There aren't many office assets in the world as imposing as these," he told a news conference in Kuala Lumpur yesterday. City Square Centre, on Jalan Tun Razak, comprised the 11-storey City Square shopping centre, the 62-storey Empire Tower office block and the 28-storey, 571-room Crown Princess Kuala Lumpur hotel. The properties have been rebranded and are now known as the Intermark Mall, Vista Tower and Double Tree by Hilton Hotel. MGPA's Asia Fund II bought the properties, and Plaza Ampang Mall, for RM760 million from a Malaysian developer in 2007. 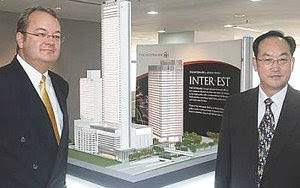 Integra is a "Grade A" 30-storey office building, which will be ready by end-2012. Wilkinson said Vista, the first component of the redevelopment, will feature a grand double-height lobby, high-speed lifts and security access control when ready by the end of this year. Rental rates have doubled to RM9 per sq ft from RM4.60 per sq ft in the last two years. "A third of the building is vacant for us to make way for the refurbishment. Some existing tenants may leave when their lease expires as they may not be able to afford the higher rates. We are in talks with a few multinational companies to make Vista their headquarters," Wilkinson added. "We expect Vista to be fully leased within 12 months after its upgrading. As bad as things are globally, we are quite confident of the market and our assets. There is high demand for Grade A office buildings in Kuala Lumpur." Wilkinson said the mall, which will offer 200,000 sq ft of retail space, and the five-star hotel will be ready by the first quarter of next year. MGPA, an independent fund that has Australia's Macquarie Group as a shareholder, will hold The Intermark, or "integrated landmark", as a long-term investment. Given the lacklustre performance of property stocks on Bursa Malaysia and the prevailing sluggish capital market, there is a likelihood that more property companies will be taken private if the bear market continues. Taking a company private at the bottom of a market cycle is a better option for the major shareholders to take over shares not already owned by them as the exercise will cost much less than if it’s done at the peak of the market. The property sector was the worst performing last year with the KL Property Index recording a 51% plunge compared with the KLCI’s 39% drop. Except for top guns SP Setia and Mah Sing, almost all property counters are trading at below book value, which means there are many cheap property companies with price valuations of around 0.5 to 0.6 time their book value. The weak capital market also undermines the ability of companies to raise funds from the public which is one of the reasons for listing a company in the first place. To take a listed company private, the buyout party must have a deep pocket to finance the exercise and plans should be in place to ensure the exercise will yield rewards to the major shareholder within the next few years. This calls for the buyout party to unlock the value of the assets, including land, owned by the privatised property company to ensure they provide consistent yields and smooth cash flow going forward. Besides a handsome cash pile, the takeover party should preferably have chain listings to allow share swaps for minority shareholders in exchange for their shares in the privatised company. Otherwise, the total sum to be forked out for the exercise will be much higher. As such, companies with rich listed parents who have the capability to offer cash and/or share swaps will be good candidates for privatisation. Taking companies private is not a new phenomena in Corporate Malaysia and there has been a rise in the number of privatisation exercises in recent years. These include Permodalan Nasional Bhd’s takeover of Island and Peninsular Bhd, Pelangi Bhd and Petaling Garden Bhd, and more recently, WCT Engineering Bhd’s privatisition of its property arm, WCT Land Bhd and IOI Corp Bhd’s proposed takeover of IOI Properties Bhd. To ensure a takeover exercise will be a win-win for both the buyout party and minority shareholders, it is prudent for the major shareholders to make a fair offer to minority shareholders so that they are duly compensated for having to give up their shares in the privatised company. Compared with the foreign shareholders who have mostly liquidated their positions when the global financial crisis unravelled in the second half of last year, local investors have greater confidence in the country’s potential and are expecting the economy and stock market to recover earlier than the other more developed crisis-hit countries. Comprising both retail and institutional investors, they are the ones who are still the pillar of the country’s economy and capital markets. Perhaps it is time to reward minority shareholders for their steadfast support through the good and bad times. Deputy news editor Angie Ng believes property companies, whether listed or otherwise, should maintain the highest quality standards at all times to improve the living environment for the people. AL-'AQAR KPJ REIT will get RM250 million in Islamic financing arranged by AmInvestment Bank Bhd and Kuwait Finance House Malaysia Bhd (KFH) to buy nine properties, mainly hospital buildings, across the country. The financing will raise its total debt to 45 per cent of shareholders fund, considered high and just below the 50 per cent limit allowed for a REIT under the rules. However, it has no immediate plan to sell more shares to pare down the gearing, Damansara REIT Managers Sdn Bhd director Datin Paduka Siti Sa'diah Sheikh Bakir said. The company is manager of the REIT. "This deal shows that the banks are still lending, especially to corporates like KPJ, whose cashflow is steady and strong," KFH managing director Datuk K. Salman Younis said after signing an agreement to seal the deal in Kuala Lumpur yesterday. The Islamic financing will help pay for six hospital buildings, one nursing college, a hotel and an office tower that cost RM397 million in total. The REIT will pay for the balance by issuing new shares to its parent KPJ Healthcare Bhd. Both AmInvestment and KFH will fully underwrite the financing, but they hope other banks will also take up some portion. As it is, the deal has received good response from several other Malaysian lenders, AmInvestment's head of debt capital markets Soo Seohan said. The profit-sharing rate will be decided closer to the draw down date, which is expected to be around April when the buildings are ready to be sold into the REIT. KPJ REIT will probably pay around 5 to 5.5 per cent, slightly higher than what it used to pay previously, but still lower than what others pay for financing in the market, senior vice-presi-dent of Johor Corp Kamaruzzaman Abu Kassim said. Johor Corp is the parent of KPJ Healthcare. Kamaruzzaman said the REIT can get better rates from lenders due to the certainty of its cash flow.